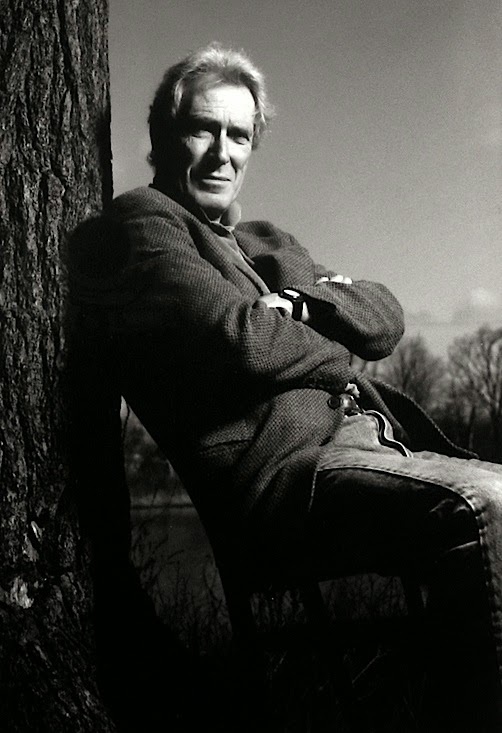 It was reported yesterday that Mark Strand had died, at 80, in Brooklyn. 80 isn't a young age, so it was not a surprise, and not tragic. Strand lived a long life, filled with literary accomplishments and honors, including a McArthur Fellowship, the Pulitzer Prize, and Poet Laureate of the United States. I've written about him before, here, and have vaguely followed his career over the years since I first encountered his poems, in the mid-1960's, in The New Yorker. Later, when I went to Iowa, at the Poetry Workshop, I read his first collection in the Rare Book Room of the university, Sleeping With One Eye Open, after having picked up a copy of his first trade collection, Reasons for Moving [Atheneum, 1968], while I was still at Berkeley. In retrospect, Strand was in every respect an establishment poet. He wasn't an experimenter with language, his poems were spare, and straightforward, and he didn't have a political or personal agenda in his work. He'd been influenced by Hispanic writers, Borges and Alberti; and as he later told us, by Wallace Stevens, though this aspect wouldn't have seemed as obvious, since his work was quite unlike Stevens's lush, elaborate and elegant surfaces. Strand's work was plain, and unpretentious. Despite its spare simplicity, his work wasn't like Oppen, or Williams, or Frost. Oddly, he seemed to have more in common with a poet like John Ashbery, or Charles Simic--with eccentric, surrealistic settings, and improbable narratives. I heard him read three times over the years, once in Berkeley, once at Iowa a little later, and much later in the 1990's, in Chicago. Strand was an imposing figure, tall, gaunt, ruggedly handsome, and a natty dresser. He was sophisticated, if a bit amused with himself, but seldom really cheerful. The mood of his poems varied between gravity and absurdity in ways that felt European. And in that way, and because of his physical presence, he seemed continental. His work is post-Modern in ways that set it apart from the post-War generation which preceded him (Lowell, Bishop, Shapiro, Jarrell, Wilbur, Nemerov, Stafford, Simpson, Logan), though formally his career fits neatly into the tradition they created. His tone is usually understated, he's never given to rhetorical flights, and he never challenges accepted standards of subject matter or styles. In manner, he's close to the later work of Donald Justice, W.S. Merwin, or even Galway Kinnell. I often read a kind of fatalistic quality in his poems, not unlike James Wright or Kinnell. It seemed to me that taking that position early in one's career was likely to become a straight-jacket later on, but Strand never wavered. He always took himself, and his work, seriously. I'm not sure why his death seems somehow unexpected, or peculiar. He often wrote about his own death, and what it might mean to know about it, as it were, after the fact. But it does. In J.D. Salinger's classic The Catcher in the Rye, the hero Holden Caulfield says at one point, "Don't ever tell anybody anything. If you do, you start missing everybody." Yesterday, it was reported that Pablo Sandoval, the San Francisco Giants' redoubtable, eccentric, and oddly charming third baseman since coming to the majors in 2003 at age 22, had signed a five-year contract (worth a reported 95 million dollars) with the Boston Red Sox. The free-agent signing wasn't unexpected. The Giants had failed to offer "The Panda" (as he had come to be affectionately known) a contract extension before the start of the 2014 season, and there was palpable suspicion on both sides--Pablo, and the Giants management--that the team's sense of his worth was less than might be deserved. --he was consistently a very good but not consistently great hitter, with some power. In fact, inconsistency was a given with Pablo. Emotionally, he presented the case of an immature, impulsive, undisciplined athlete, given to swinging at bad balls, especially in clutch situations. His physical mannerisms, and presence, suggested boyish enthusiasm. 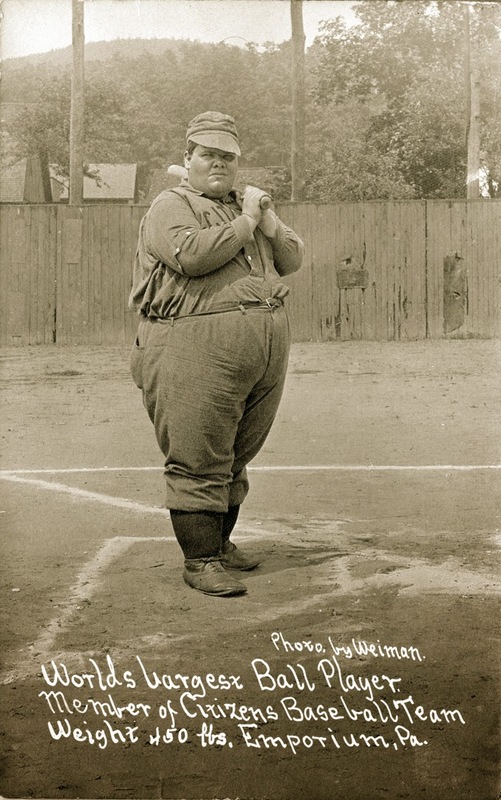 Also, as became routine each season, Pablo had a weight problem, which threatened to impede his balance, speed and efficiency, both at the plate, and in the field. For a man of his physical build, he seemed incredibly agile and quick, "like a cat," announcers would often remark. He could dive for screaming line drives on either side of him, leap to his feet, and make lightning throws to first base. Opposing pitchers often despaired of facing him, since he was as likely to strike a ball well out of the strike-zone, for a hit, as he was to swing through a straight fast-ball down the middle. You could outsmart him, pitch around him, but he might still beat you, swatting a pitch a foot outside into left field for a double. Though nominally a switch-hitter, his performance has increasingly been from the left side of the plate, this comparative advantage being as much as 100 points average difference. Given his height and weight, he was a slow runner. Playing at China Basin park, his home run totals, given the long right field dimensions, would never be impressive. Pablo was a "contact hitter," a "spray hitter"--unpredictable, frustrating, and perplexing. His coach, Bruce Bochty, understood Pablo's character, and usually left him alone, realizing that his fragile emotional immaturity would be unlikely to respond to direct criticism or scolding. Pablo rewarded this patience with great performances in big games. Christened the "Kung Fu Panda" by x-Giants hurler Barry Zito, the nickname stuck, and before long, the stadium was full of "panda hats" and head-masks. 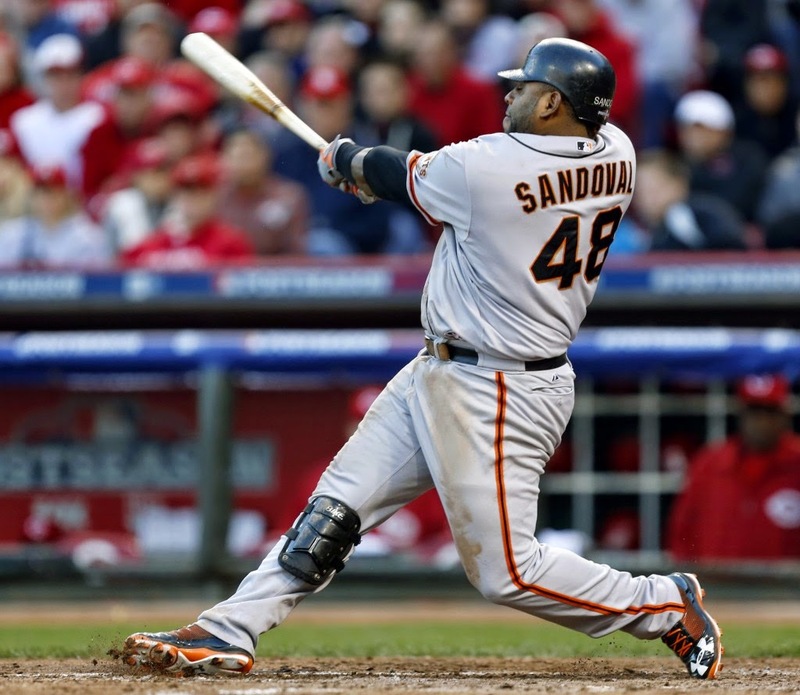 Sandoval was a fan favorite, as much for his roly-polly onfield presence as for his unlikely heroics. As a regular fan of the team, I probably heard or saw him play at least 500 times, and he became an accustomed persona in my world. Pablo didn't speak good English, and tended to seem a little exotic in person. You wondered what he thought about things, and how he might seem off the field. A native Venezuelan, he must certainly have felt strange in 21st Century America. Playing for the Boston Red Sox, given is big free-agent contract, Pablo will have big expectations to fulfill. Bosox fans will undoubtedly become impatient with him, and one suspects that, unless he exceeds the usual demands of a big-time free-agent star, he isn't likely to command the same respect and appreciation he did in San Francisco. Just before the beginning of Game 7 of the 2014 World Series, in Kansas City, the television cameras panned into the Giants dug-out, where Pablo could be seen going down the bench, whispering into the ear of each Giants player. It seemed clear that he was probably making his heart-felt good-byes to each of his team-mates, the implication being that he already had decided, perhaps unconsciously, that this would be the last chance he would have to do that. Or so it seemed to me at the time. As it turned out, the Giants apparently had ended up offering Pablo an equivalent amount of money for an equal number of years, as Boston had. But Pablo must have felt, in some sense, betrayed, and wished to go somewhere he was appreciated. Professional baseball is a business, and the players are employees. Baseball is a game, with rules, but a great part of the appeal for the fans, perhaps the most important part, is the sentiment of joy and caring that go into their appreciation. Identifying with players, spending one's hopes and fears on the performance of a group of grown men striving to succeed at a "boy's game" is a kind of legitimate folly that is as much a part of the American experience as democratic politics, or outrageously avant garde art, or fighting in foreign wars. It may be that we crave unlikely heroes, people who (like us) dream of being on the world's stage, striving to exceed our native abilities, and occasionally overcoming impossible odds to achieve feats of daring or skill. This certainly accounts for some of Sandoval's appeal. He was one of us, imperfect, unusual, and not always in complete control of his emotions. The hole he leaves in the Giants' heart can't be filled. The Giants may sign a slugging outfielder, or a new young rookie third baseman may arrive on the scene. But the Panda is irreplaceable, a key component of three championship teams, and a quirky, funny boy-man who alternatively broke our hearts, and heartened us. *The full quotation is "I felt that I was leaving part of myself behind, and that wherever I went afterwards I should feel the lack of it, and search for it hopelessly, as ghosts are said to do, frequenting the spots where they buried material treasures without which they cannot pay their way to the nether world."